Canine Companions for Independence and they also know he loves custom picture framing. What they might not know about Tom is that his heritage is pretty fancy. His paternal grandfather, for example, was no less than the Prime Minister of Sweden and a delegate to the United Nations. Probably because of that background, Tom’s parents had a not-too-secret hope that he would in some way become a diplomat. As it turns out, that wasn’t to be – although one could argue that he uses diplomatic skills to negotiate the complex world of his growing family. On the family side, Tom has been married to his wife, Sondra, a professional speaker, for almost as long as he has been in business. His daughter, Krista, is a lawyer who – lucky for him – lives only a few blocks from the shop with her husband Gil and their daughters, Maia and Lisette. Tom is also glad to be living near his step-daughter, Shea, her husband, Garrett, and his other grandkids, Alexandria (Lexi), Aiden, and Eva. 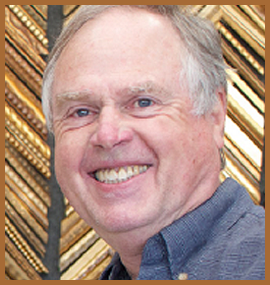 Tom has been picture framing since 1973, but has taken breaks through the years to do such exciting things as take a trip around the world with his parents – a trip he won on the quiz show “The High Rollers” (it’s a great story – drop by the shop and I’m sure he’ll be glad to tell you about it in detail). He has also traveled to Egypt twice, sailed through the Panama Canal on a freighter (more on that below), and took an ocean liner across the North Atlantic in the days when the term “cruise ship” did not exist (Think “Queen Mary,” not “Princess Cruises”). Now, back to that trip through the Panama Canal. We mention this because we think it is important that you be warned that there is a mischievous side to Tom, one that goes all the way back to when he was a mere four-years-old. That’s how old he was when he and his parents took the Panama Canal trip. You’d think that the excitement of traversing a complex series of locks would be enough to entertain even the most rambunctious four-year-old. Apparently not, because one afternoon Tom decided it would be fun to hide under a table so that the adults would have the “fun” of tracking him down. The problem was that the adults – including his soon-to-be-hysterical parents – weren’t in on the game. Naturally everyone assumed he had gone overboard. Fortunately, just as they were about to turn the ship around, one alert passenger heard a soft boyish giggle emanating from under a long white tablecloth. The jig was up, but Tom’s mischievous side had made its debut. 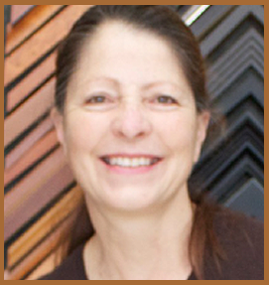 We’re very lucky to have Robin’s design talent and easy-going personality as part of the team at The Frame Station. Among many other things, she is a dog lover like the rest of us. You should meet her latest rescue dog, “Twinkle” – talk about cute! Robin also loves gardening, painting, beading, knitting, and sewing (she has even designed and sewed custom-Christmas socks for the young people in our family). I must admit, though, she does have one peculiarity – Robin LOVES shoes. She has even been known to match them to her shirts! Perhaps she’ll pass this trait on to her delightful granddaughter, Simone. The rest of Robin’s family consists of her husband Donal, son Marcus, daughter-in-law Leila, and grandson Sonny. Robin works most days at the shop. Come on by and say hello, maybe she’ll show you her latest pair of shoes. © 2016. FRAMESTATION.BIZ. All Rights Reserved.